Acide doux (L. 7308). Original color lithograph, 1973. 90 signed & numbered impressions and 30 artist's proofs on Rives, plus 20 HC impressions on velin de Zerkall. 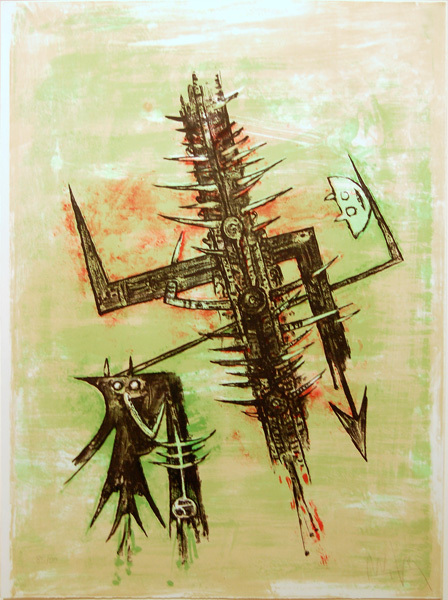 Printed by Erker Presse in St Gallen and published in Hommage à Picasso (Berlin, 1973). Exhibited in museum shows in Stockholn, Paris, Barcelona, and Beijing. Image size: 760x560mm. Price: $3250. Montée de sèves (L. 7410). 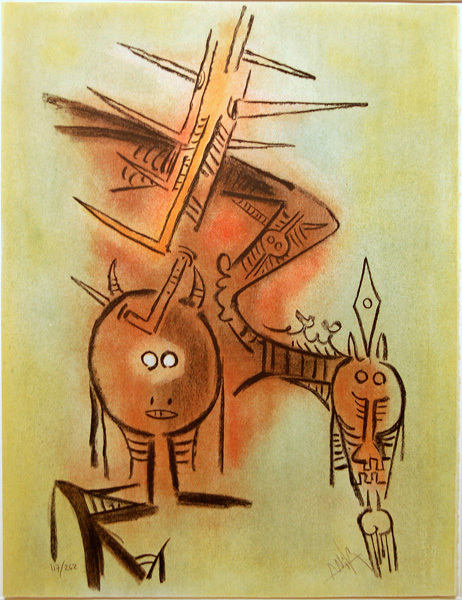 Original color lithograph, 1974. 262 signed & numbered impressions on Arches paper (of which ours is 117/262) and 50 on Japon for the portfolio Pleni Luna. This work has been exhibited in museum shows in Stockholn, Malmo, Mexico City, Copenhagen, and Beijing. One of Lam's most beautiful color prints. Published in Stockholm by A. H. Grafik in 1974. Image size: 650x498mm. Price: $3500. Belle épine (L. 7412). 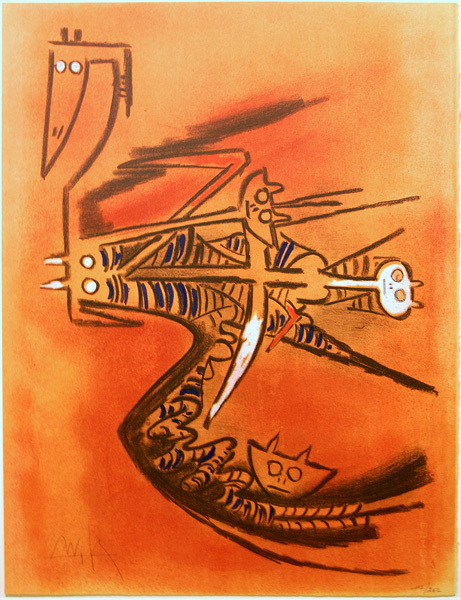 Original color lithograph, 1974. 262 signed & numbered impressions onArches paper and 50 on Japon for the portfolio Pleni Luna. This work has been exhibited in museum shows in Stockholn, Malmo, Mexico City, Copenhagen, and Beijing. One of Lam's most beautiful color prints. Published in Stockholm by A. H. Grafik in 1974. Image size: 650x498mm. Price: $3500. Elle, casqué (L. 7414). 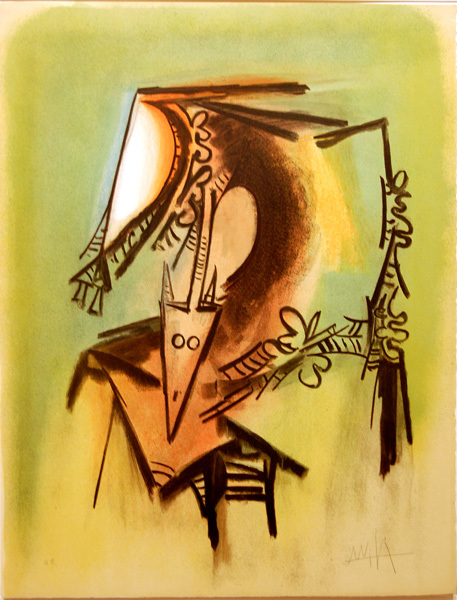 Original color lithograph, 1974. 262 signed & numbered impressions on Arches paper (of which ours is 117/262) and 50 on Japon for the portfolio Pleni Luna. This work has been exhibited in museum shows in Stockholn, Malmo, Mexico City, Copenhagen, and Beijing. One of Lam's most beautiful color prints. Published in Stockholm by A. H. Grafik in 1974. Image size: 650x498mm. Price: $3500. Soeur de la Gazelle (L. 7416). 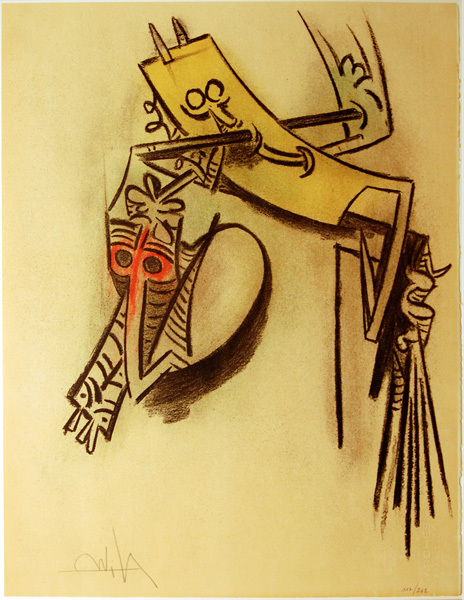 Original color lithograph, 1974. 262 signed & numbered impressions on Arches paper (of which ours is 117/262) and 50 on Japon for the portfolio Pleni Luna. 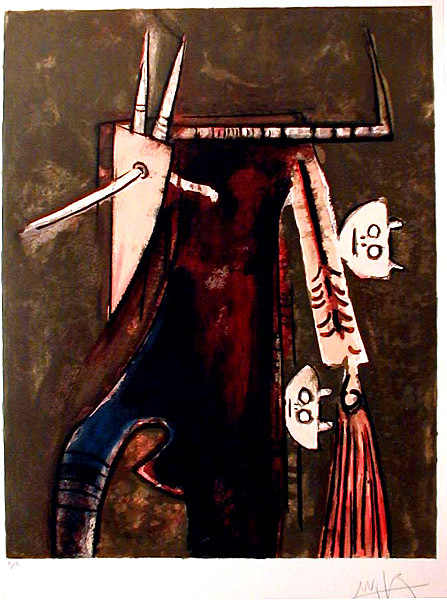 This work has been exhibited in museum shows in Stockholn, Malmo, Mexico City, Copenhagen, and Beijing. One of Lam's most beautiful color prints. Published in Stockholm by A. H. Grafik in 1974. Image size: 650x498mm. Price: $3500. Innocence (L. 7417). 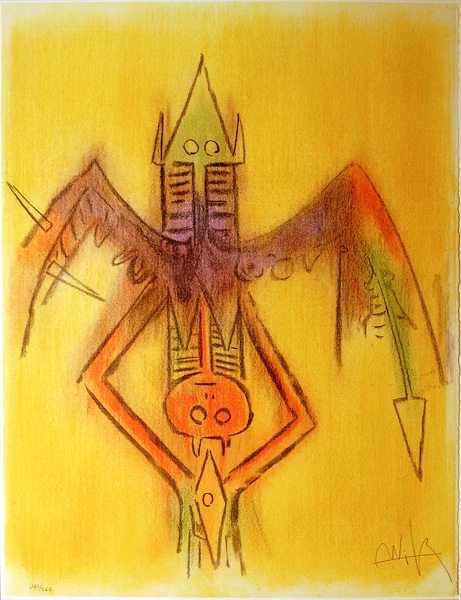 Original color lithograph, 1974. 262 signed & numbered impressions on Arches paper (of which ours is 117/262) and 50 on Japon for the portfolio Pleni Luna. This work has been exhibited in museum shows in Stockholn, Malmo, Mexico City, Copenhagen, and Beijing. One of Lam's most beautiful color prints. Published in Stockholm by A. H. Grafik in 1974. Image size: 650x498mm. Price: $3500. Bonjour Max Ernst (L. 7603). 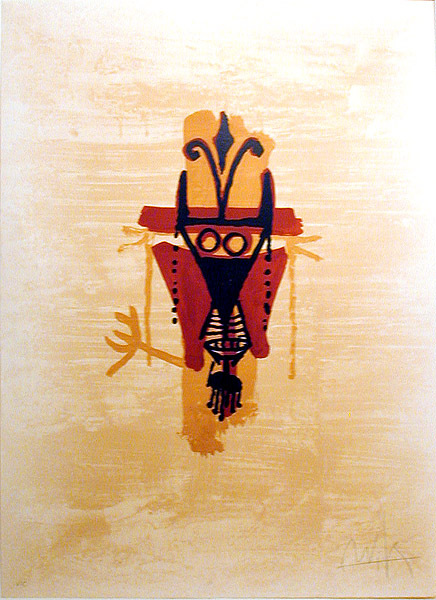 Original color lithograph, 1975. 100 signed and numbered impressions on Arches. 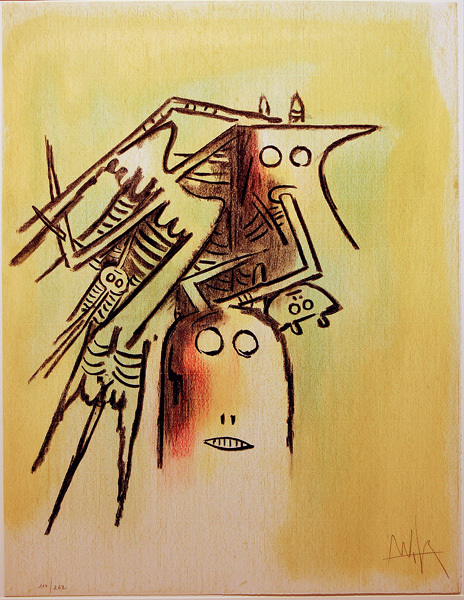 A very rich print done in tribute to Max Ernst, one of the fathers of the Surrealist movement. This work has been exhibited in museum shows in Geneva, Barcelona, Stockholn, and Beijing. Image size: 622x485mm. Price: $3500. Les loa petro enfantent dans la danse (L. 7305). Original color lithograph, 1973. 180 signed and numbered impressions on different papers. This work has been exhibited in museum shows in Savona, Söderberg, Paris, and Beijing. A very beautiful and striking piece. Image size: 640x500mm. Price: $3250. Paris (L. 7618). Original color lithograph, 1976. 99 signed and numbered impressions on Guarro paper. Image size: 760x560mm. Price: SOLD.